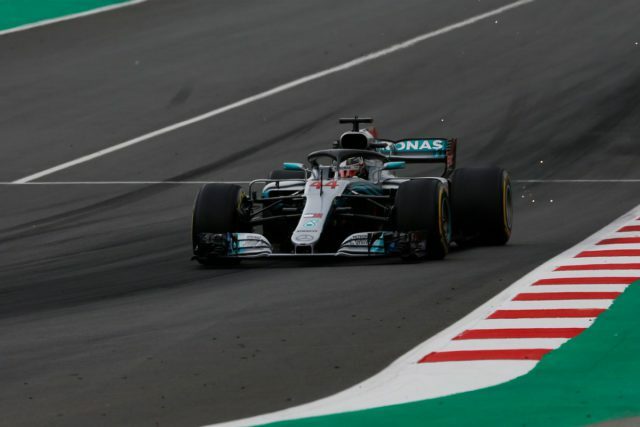 Mercedes have claimed the front row at the Circuit de Catalunya, with Lewis Hamilton on pole ahead of Valtteri Bottas. Ferrari’s Sebastian Vettel claimed P3 after a tough start to Q3 for both Scuderia cars. Q1 in Barcelona was a largely straightforward affair, with just four drivers set to be eliminated, due to Brendon Hartley being unable to take part. This was due to a heavy crash in FP3 that saw the Toro Rosso suffer significant damage after he smashed it backwards into the barrier at Turn 9. He was uninjured. The session itself ended with Sebastian Vettel fastest on the SuperSoft tyres. He was 0.4 clear of Max Verstappen and 0.6 clear of Lewis Hamilton’s Mercedes in P3. Eliminated, along with Hartley, were Williams’ Lance Stroll & Sergey Sirotkin, Renault’s Nico Hulkenberg, & Sauber’s Marcus Ericsson. Hulkenberg was eliminated after a fuel pressure issue resulted in his car. While he managed to get in a clean lap towards the end, it wasn’t enough to get through. Lance Stroll brought out the yellow flags with. He did minor crash in the final sector as the chequered flag fell to end the session. Q2 saw the first real on track exchange of laptimes between the Mercedes & Ferrari drivers, with all four crossing the line on their first runs on the Soft tyres. Hamilton initially went quickest, immediately usurped by Valtteri Bottas, before the Ferraris of Raikkonen & Vettel crossed the line to go fastest. Vettel’s time of 1:16.8 remained unbeaten until the end of the session. Even when Hamilton went out on a set of SuperSofts to gauge the pace on the softer compound. He backed off to ensure he didn’t beat his best time, meaning that all the frontrunners start on the Soft compound. Eliminated were McLaren’s Stoffel Vandoorne, Toro Rosso’s Pierre Gasly, Force India’s Esteban Ocon, Sauber’s Charles Leclerc & the other Force India of Sergio Perez. Heading into Q3, it was SuperSofts all around as the drivers peeled out for their first runs. Lewis Hamilton put in a 1:16.491 to go fastest. But it was Red Bull who joined the party at the front, rather than Ferrari. Max Verstappen went P2, 0.3 down on Hamilton, with Ricciardo thousandths further back in P3. Bottas went P4, with the first Ferrari down in P5 with Vettel after an unrepresentative lap. Raikkonen was even further back after a mistake at Turn 1, down in P7 and with McLaren’s Fernando Alonso ahead of him. The two Ferraris, as well as Daniel Ricciardo, opted to head out on the Soft tyres for the second runs. They appeared to struggle a little on the SuperSoft in the cooler temperatures. Hamilton, sticking with the red SuperSofts, found another 0.3 on his second run. While Raikkonen used the Soft tyre to jump to P2 and 0.1 down on Hamilton. However, Bottas & Vettel found more and slotted into P2 & P3 respectively. The top ten finished with a Mercedes 1-2, Hamilton ahead of Bottas, an all Ferrari second row of Vettel & Raikkonen, Verstappen & Ricciardo P5 & P6 respectively for Red Bull, Haas’ Kevin Magnussen a sterling P7, Fernando Alonso lines up P8 for McLaren at his home race, Renault’s Carlos Sainz P9 at his home event too, with Romain Grosjean P10 in the second Haas. The championship leader takes his second pole of 2018 ?